How do you engage your preschooler on a very hot summer day? Get a dish pan/tub and fill with 4 cups of flour. Equip them with shovel,pail,cups. Hours of indoor fun guaranteed. CJ enjoyed playing with her new shovel and pail. 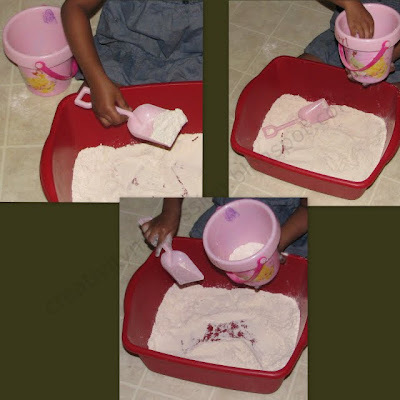 She filled the pail with flour, poured it out again into the tub and repeated the process. She also came up with the idea of playing with rocks and flour. So I hid the rocks in the flour and She played dig, dig, dig! 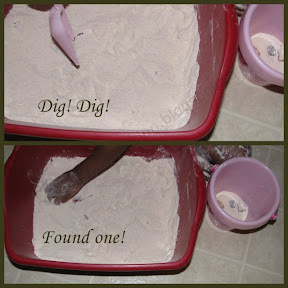 Flour is wonderful for playing and exploring with! Must do it this summer with the kids! ha! love it--will certainly add it to my summer must-do list! thanks for linking up to our smart summer challenge, and we hope to see you next week! I wonder if adding a little spice (for scent) to the flour would increase the sensory opportunity without changing the color and consistency. I just may have to try it.